Created by: Janice Canela by the use of pages. What if humans could only produce one child in one lifetime? Why is this question meaningful to me? This question is meaningful to me because I’ve always have had an interest for Human resources, research and statistics. Humans are very interesting creatures. We do a lot of explainable things that can be both good and bad. Everyone has there on opinion, characteristics, personalities, likes and dislikes. The number one question I’ve always had for this particular type of science was this one. I finally get a chance to research about this question that I’ve been curious about for the longest time now. I thought it’d be a great idea to finally get a somewhat clearer answer to my question. Why is this question meaningful to others? This question is meaningful to others because I know for a fact that I’m not the only who is interested in human resource, research and statistics. Also, I know that I’m not the first person to come up with this question and I’m not the only person to be interested in wanting to more about this question. I mean, imagine a world where siblings, cousins, aunts, uncles didn’t exist. Imagine being an only child, along with everyone else in the world. Wouldn’t you want to know what would happen if that this question was reality? Will having less people mitigate global warming and other pollution related issues? Will the animal population increase drastically? Will having lower unemployment rates result to the poverty rate decreasing? Will Earth become a richer planet? Will less people in world result to more deaths because there are less scientists and doctors? Will scientists and doctors be able to cure new diseases and or current diseases with their title resources? This website explains that us humans are just 0.01% of living things, but yet we have disfigured about 83% of all wild mammals and half of the population of plants. However, livestock has kept humans thriving. We’ve lost 83% of wild mammals, 80% of marine mammals, 50% of plants and 15% of fish. Plants are 82% of all biomass which is 7,500 times more than humans. Humans have a very dominant role that plays on Earth; we cause population destroying many habitats, historical animals and making the earth hotter and hotter very year which makes our arctic oceans melt drastically. Humans should eat less meat for the sake of our livestock. “Our dietary choices have a vast effect on the habitats of animals, plants and other organisms.” said Prof Ron Milo. This helps answer my question because I think if human could only produce only child which means that mankind will slowly decrease that the population of wild mammals, marine mammals, plants, fish and livestock will increase drastically. Less people in the world would mean less of our other living things not including humans will slowly increase or increase drastically. If people could have one child per couple, animals would overpopulate; we could have animals running around in the streets. This website explains the causes, effects and solutions to the overpopulation. It talks about how in half a century the population has expanded drastically. Pollution, climate change and water shortage are a very big problem to this world but as a big as overpopulation. the overpopulation is the cause of many environmental issues here on Earth. Poverty plays a very big role in the cause of overpopulation because they don’t have access to education which means they can’t get a high paying job. That leads to high death rates because they can’t afford medicine and going to the hospital. The high birth rate as well; unexpected pregnancies. Children at a young age work for income for their family. Approximately 150 children are working in countries with little to none child labor laws. Some women get sold off for money, these women usually go through many pregnancies. Other causes are immigration, fertility treatment, reduced mortality rates and poor contraceptive use. They say that we only have roughly 1% of world’s water fresh and accessible. “Some estimates state that human demand for fresh water will stand at approximately 70% of what is available on the planet by 2025. This will place those living in impoverished areas that already have limited access to such water at great risk.” – Renewable Resources Co, December 6th 2016, Overpopulation : The Causes, Effects and Potential Solutions, Renewable Resources Coalition, https://www.renewableresourcescoalition.org/overpopulation-causes-effects-solutions/ – Extinction is also one of the overpopulation’s effect. Studies have shown that 60% of wildlife has gone extinct and if humans continue at this rate about 50% of the world’s wildlife species will be at the risk of extinction. If the population increase more then the decrease in the number of wildlife on Earth. Faster climate change is also an effect to the overpopulation. “97% of the scientific community agrees that human activities are changing global temperatures. Larger populations may speed these changes up, especially if more is not done to reduce individual carbon footprints on a wide scale.” – Renewable Resources Co, December 6th 2016, Overpopulation : The Causes, Effects and Potential Solutions, Renewable Resources Coalition,https://www.renewableresourcescoalition.org/overpopulation-causes-effects-solutions/ – Other effects are the increased intensive farming, resource consumption and lower life expectancy. This helped answer my questions because there were less people in the world the poverty rate, child labor and birth rates wouldn’t be so high. The wildlife wouldn’t be in danger as of right now. Climate change would decrease drastically because if a couple could only have one child then the carbon footprint wouldn’t be very high. This website explains the Causes and Effects of overpopulation. It talks about how the falling mortality rate, mainly due to medicine, progress in food production and migration and urban concentration. The industrial revolution was when the world of medicine was introduced. Overcoming deadly diseases that could only end in death. Vaccination and antibiotics have saved the population. The death rate went down while the birth rate went up which increased the population even more. “scientific research and technological improvements saw more efficient agricultural production, resulting in year-round crops, more resistant seeds, pesticides” – Causes and Consequences of overpopulation, Sustainability For all, https://www.activesustainability.com/sustainable-development/causes-consequences-overpopulation/ – Which helps and nourish for the population. Also, this site talks about natural resources, environmental degradation, rising unemployment, rising living costs and technological advances. The unequal and unrestrained use of resources. High numbers of workers limits the number of opens in jobs lead to high rates of unemployment. “increasing living costs in most countries. Fewer resources, less water, the packing of many people into confined spaces and a lack of money are provoking an increase in the cost of living whereby only a percentage of the population will be able to cover all their needs.” – Causes and Consequences of overpopulation, Sustainability For all, https://www.activesustainability.com/sustainable-development/causes-consequences-overpopulation/ – This helps answer my questions because I needed to know what was the cause of overpopulation throughout the years. If there were less people in the world, it could mean that some diseases wouldn’t be able to be cured from the lack of scientist and doctors. The unemployment rate would probably go down because the lack of people. There is always a lot more research that needs to be done for my wonder question. This wonder question isn’t a yes or no question or a question that could truly be answered. I would research more global warming and pollution related issues, the wildlife population, unemployment rates, poverty rate, death rate, birth rate and the how the economy is now. Is there a community expert that could be helpful? Unfortunately no, probably not in my community, well not that I know of. Can a scientific investigation/experiment help you determine your answer? I mean you could try it on rabbits and see if it would affect them. However, it doesn’t really help with global warming and pollution related issues, the wildlife population, unemployment rates, poverty rate, death rate, birth rate and the economy. I’d rather not try it on humans because I don’t think anyone would agree and also we can’t control the amount of babies one has. The questions I needed to research in order to research my topic were the causes of overpopulation, effects of overpopulation and pollution caused by the overpopulation. I tried to research about the overpopulation mainly because I could think about the answers to some of my questions the other way around. What new or familiar digital tools did you use as you worked through this project? I mainly used online researches because they were the easiest to access. I would have used library databases but I couldn’t find any because I didn’t know how to, I tried and failed. I learned how to cite information and used it in this blog post. I thought of a questions and searched it up but when I couldn’t find any matching my question, I reworded my questions and then I got some answers after. Or when I couldn’t find any matching my question, I looked at what websites appeared and read some which helped me get a different question to search up. I verified by looking at different articles that website had to see if I could trust it or not and viewers and comments. I cited the information I found by researching ways to cite a website. The process of completing this was challenge because my question isn’t a yes or no question or a question that could truly be answered. I had to use some critical thinking and my judgement to help me find questions to ask. I could have thought of better questions to research and of course have had done more research on my topic to improve my blog post. Great wonder question. I really liked how the video you included explained population growth in simple terms with the point that: “It is beneficial to you personally if people on the other side of the globe can live a good life.” It gave evidence to how population growth levels off as conditions get better. 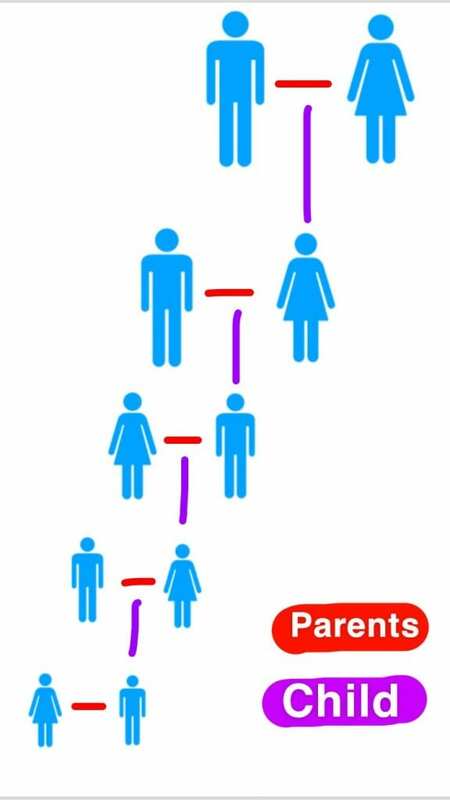 I liked your picture at the top of the post too but it would be even more telling if you added the parents of the other side so that it would be an upside down triangle. That would demonstrate how population would be reduced if humans could only produce one child in one lifetime. Great work. Thank you! I’m glad to know you liked it. Wow, I’m amazed of how you thought about this wonder project! Also, the overall set up; I really liked it! I liked how you put a lot of your own input into this blog post. The length of each sources was good and how you explained how that site helped you answer some your questions. Keep up the good work, Janice. It’s true, this question really interested me. I liked how you said imagine not having any cousins, aunts and uncles, the imagery helped me understand this question,. Also, the picture that you made helped as well and the video did too. I liked how you wrote in detail for each paragraph. Nice work, Janice. I really like your wonder question, very intriguing! I liked how you put a lot of your own thoughts and explained each website clearly to help us understand. I also liked how you included a video into your blog post. keep up the good work Janice!! Your question is very intriguing and well researched. I would like to see some more articles describing what professionals think would happen if people were only able to have one child. There are parts of the world that have gone through this and it would be interesting to see the effects of this law. Your topic is very interesting and your video is also informative. Great job! Thank you, I’ll remember to do so in the future.